An all-round headset offering PS4 audio, NFC, Bluetooth and PC and Mac soundcard. Creative is better known these days for its gaming headsets but the EVO ZXR is designed first and foremost for music. Featuring NFC tech for pairing via Bluetooth, you can listen wirelessly while also plugging into any 3.5mm source or to any computer using a super-long microUSB cable. Compared to the Creative Sound Blaster EVO Zx headset which we gave 4 stars, the ZXR comes with a number of improvements. Firstly you've got the significantly larger 50mm drivers which do a good job of widening the sound field and delivering a more full-bodied sound. That sounds like a load of gobbledygook I tested both side-by-side and the ZxR does sound significantly better. Then there's the addition of active noise cancelling to filter out white noise on planes, trains and automobiles and there's also a super funky talk-through 'TT' button which silences your music and passes through sounds from the outside world so you don't need to take the ZXR's off your bonce in order to talk to someone. That's a very cool feature that we first saw on Shure earphones many years ago and should have been implemented into more products by now. We like a lot. Noise cancelling works about as well as any other battery-powered headset which means it's imperfect. General hums are nixed while more variable noises, especially at noises above ambient, will still get through. This is par for the course with noise cancelling - I'm surprised the tech hasn't advanced more in the last five years. Creative claims that the ZXR can deliver virtual 7.1 surround sound but I'm always skeptical about claims like this. Yes you can use some algorithmic trickery to time delay certain sounds so that they get to your ears at slightly different times. This creates the illusion of a 3D soundscape but in truth it's always a bit hit and miss. It's certainly no worse in this product than any other but it's not the silver bullet for 3D audio either. In our opinion it's unnecessary but if you like that sort of thing, these cans won't let you down. Instead of a detachable or retractable microphone, Creative has built in stereo microphones to both the earcups. This means the mic won't break 10 seconds after taking it out of the box and you won't lose it down the back of your desk, either. It works great for using Skype or Steam for voice chats and you can use it to make calls on your mobile device as well. Near-field Communication tech is built into the right earcup which means if you have an NFC-equipped phone you can hook up a Bluetooth connection simply by tapping the two devices together. I found this process to work perfectly well and it only took a few seconds to pair up and get music streaming into my dual-earhole array. You can pair the headset with two devices at a time, too, if you so wish so you can be watching Netflix on your tablet and then make or take a call on your mobile at the same time. The headset is rechargeable so it draws its juice from the microUSB port – no replaceable batteries here. Battery life was excellent – I listened for most of a working day over Bluetooth and didn't run out of power. The stated battery life is 8 hours but I managed a bit more than that. Curiously, while the ZXR is most at home as a PC or Mac headset and has the capacity to perform the job of a decent soundcard, unless your device is Bluetooth enabled you're going to need to stay plugged in using the super-long USB cable. It's not too much hassle but it is a bit of a pain in truth - Creative's gaming headsets use 2.4GHz wireless but I'm guessing this would have pushed the price up a bit too far and added bulk to an already formidable headset. The headset works as a competent PS4 headset which means it's up with the times. It comes with a 4-pole audio cable which you plug into your DualShock 4 controller. From there you simply change your PS4's sound settings to 'Output to Headphones' and you're away. It's super easy and it works flawlessly. It sounds great, actually. Better than I anticipated, but the sound won't be for some. If you're a B&W P7 sort of person, the Creative ZXR will not appeal purely on sound quality. It's a headset that's tuned to sound great with popular music, which means bass and treble fizz and pop with aplomb. Creative's familiar Crystaliser tech is deployed here, now under the guise of 'SBX' – it's designed to analyse your music and replace the highs and lows that get stripped off during file compression. You can toggle this on and off using a button on the headset and you'll notice the difference; more punch and energy to the sound. It works, but that's no surprise as Creative has been using this magic for years. If you prefer a more flat output, you can achieve this using the EQ. There is an app you can install on your mobile and tablet and from there you can change your sound settings and tune them to your own liking. However you like sound though, this headset sits above any pure gaming headset and most other 'PC' headsets. Frankly at this price, you'd expect them to be pretty good, wouldn't you? The TT button – which mutes your music and passes through outside sounds – is brilliant and as mentioned above, we wish more products did this. It's so simple and it works so well - such a small feature but a very welcome one. In the box you get a basic carry case, a long USB cable for using your headset as a PC or Mac soundcard, a 3.5 cable and a 3.5mm extension for splitting sound and microphone input/output if you just want to plug into your PC's existing soundcard. 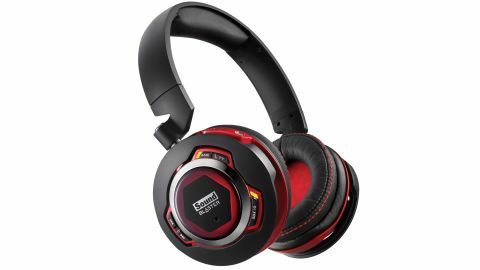 I like the Creative Sound Blaster EVO ZXR headset more than I was expecting to. They sound great, and the multitude of ways you can use them and devices they'll hook up to is fantastic. The TT mode is a brilliant inclusion and they look OK as well if you like the 'funky gamer' look. Build quality is a bit lacking if we're honest, there's a lot of plastic on show, but it's solid enough and forgivable because of all of the other features on offer. The main drawback is, of course, the price. It's not bad value as such, as you get so many clever techy features in this headset. But if you only want to listen to music on your iPod, there are cheaper options out there.